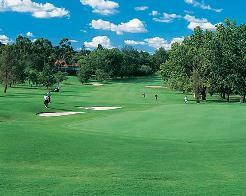 Wanderers Golf Course is situated alongside the famous Wanderers cricket stadium. 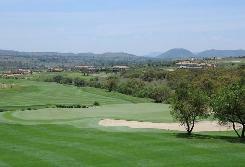 This scenic 18-hole course is centrally located and plays 6 274 metres long, with a par of 72. Opened in 1939 it has been improved upon over the years and in 1999 the greens were resurfaced, redesigned, increased in size and planted in areas of maximum sunlight. All bunkers underwent drastic re-shaping incorporating the latest golf course technology. Addition of fairway bunkers to holes 5, 7, 9 were added in 2004, the whole resulting in an excellent golfing challenge. 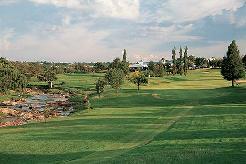 Currently in the top 40 South African courses, this layout too has hosted many local tournament events. The course is placed right next door to The Wanderers test cricket ground, and the sports lovers in Johannesburg are occasionally torn between watching Ernie Els burn up the golf course, or walking across to the cricket stadium to see the Protea cricketers in full cry. The clubhouse underwent an upgrade in 2004 and Compleat Golfer magazine recently rated Wanderers' �19th hole�, which enjoys a magnificent view of the course, as one of the best in the country.